Tailored Brands, the latest evolution of the former Men's Wearhouse, said it will shut down about 250 stores this year after a steep decline in Jos. A. Bank sales. Tailored Brands said on Wednesday that Jos. A. Bank net sales plunged 32% in the fourth quarter, which ended Jan. 30. So the company is planning to shutter 130 to 140 Jos. A. Bank stores this fiscal year, which began Feb. 1. "While our fourth quarter and full year results were consistent with our revised guidance, we remain very disappointed by the weak Jos. A. Bank results," said Tailored Brands CEO Doug Ewert, in a press release. The company said it will also close 100 to 110 MW Tux stores. The company managed to eke out a gain in net sales last year, but it suffered an operating loss of $1.1 billion. The company had been well known for its deeply discounted suits and shirts, like its "buy one get 3 free" suit sale. This discount was so extreme that it inspired a Saturday Night Live skit where the comedians use Jos. A. Bank suits to mop up kitchen spills, instead of the more expensive paper towels. The company terminated its signature sales in October 2015, but the move has backfired. "Our transition away from unsustainable promotions has proven significantly more difficult and expensive than we expected," said Ewert. The CEO is expecting more grim news ahead. Ewert said he projects same-store sales of "negative mid-teens" in fiscal year 2016. Men's Wearhouse bought Jos. A. Bank in 2014 for $1.8 billion. 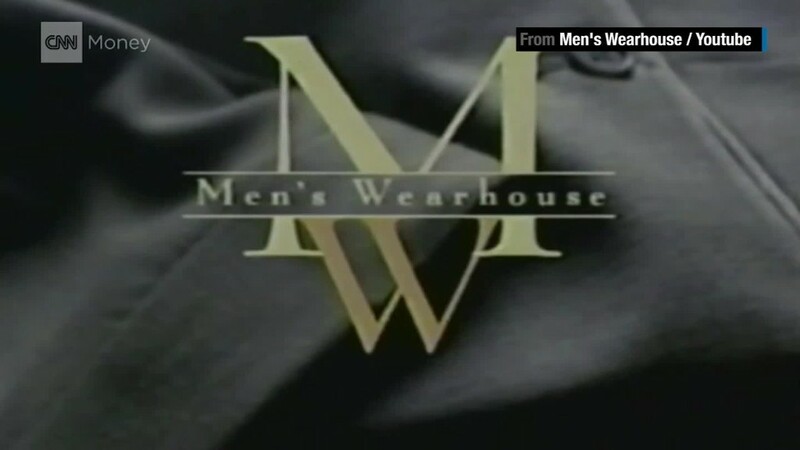 Men's Wearhouse was founded in the 1970s by the raspy-voiced George Zimmer, famous for saying "You're gonna like the way you look, I guarantee it," in commercials when he used to run the company. He was fired by the board in 2013, but he still has a stake, which caused him to lose $10 million when the stock tanked last year. "It hurts me financially, but it pleases me emotionally," Zimmer said to CNNMoney's Christine Romans last year. He has gone on to form startups zTailors and Generation Tux.